ISPO , the world's largest multisegment fair in the international sports business, was held at the Messe Munchen Conference Centre in Munich, Germany on 28-31 January 2018. 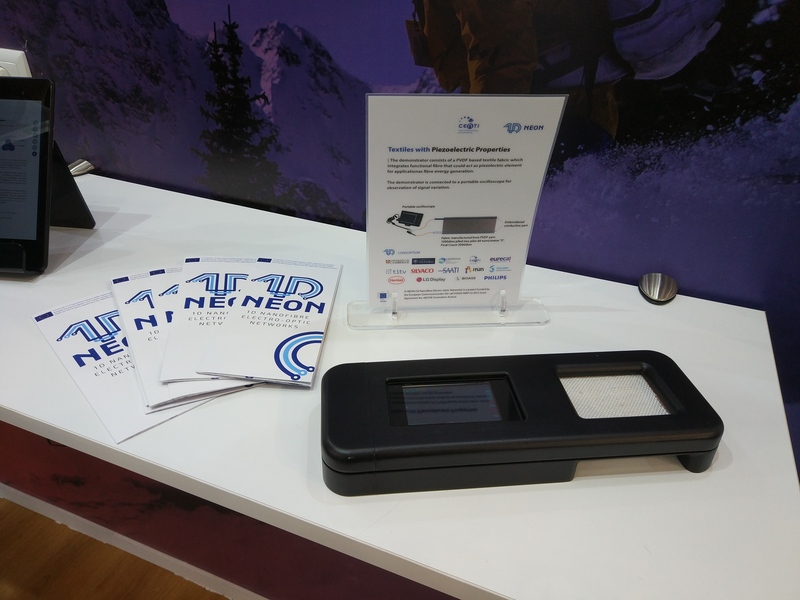 This year 1D-NEON was represented at ISPO by partner CeNTI which presented 1D-NEON prototypes in their booth. The 4th annual Innovations in Large-Area Electronics Conference was held at the Wellcome Genome Campus Conference Centre in Hinxton, Cambridge, UK on 23-24 January 2018. This year 1D-NEON was represented at innoLAE by partner BioAge which presented several 1D-NEON prototypes in their booth including Bright Smart Curtain and Supercapacitor on Fibre. The MRS Fall Meeting 2017 conference, held in Boston (USA) from November 26 to December 1 2017, is a world wide forum for discussing recent advances in the field of materials science. This year 1D-NEON partner UNINOVA is presenting project related results in 3 posters regarding the development of solution-based materials for low temperature electronics. 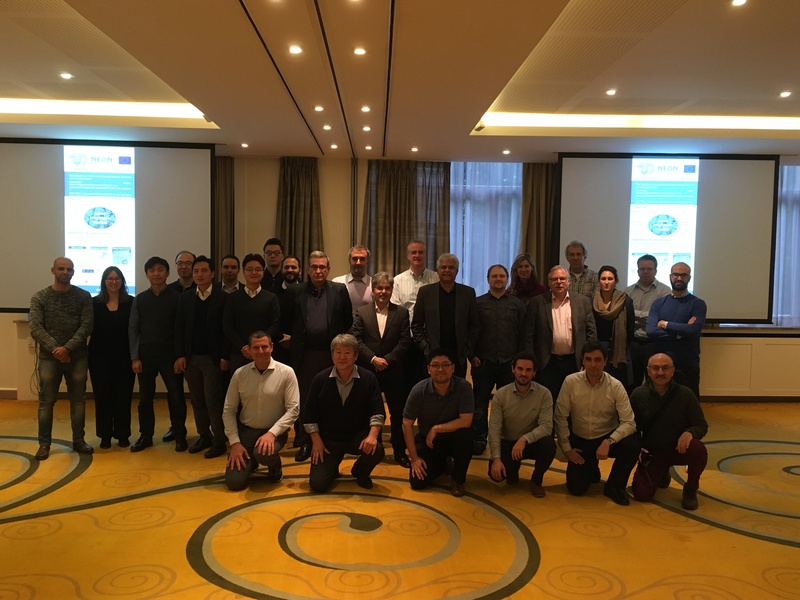 The 18M project review meeting was held in Brussels (Belgium) at EC facilities, 8-9 November 2017. The Industrial Innovation Info Days held on 3 and 4 October 2017 in Brussels is a major event, which gathers more than 1000 participants, with the purpose to inform stakeholders about activities in the “Key Enabling Technologies” part of Horizon 2020. 1D-NEON project poster was presented and 1D-NEON flyers & Newsletter were provided to several stakeholder. We are proud to announce that the start of the 1D-NEON Webinar series was a success! Thank you to our Organizing Partners Solvay Specialty Polymers Italy and CeNTI for such an interesting event and YOU for attending! The Dornbirn Man-made Fibres Congress, held inD ornbirn, Austria from 13-15 September 2017, is a leading innovation platform for the global fibres, textiles, nonwovens, and equipment and machinery industry. This year 1D-NEON project's results are presented by 1D-NEON partner CeNTI. The IUMRS-ICAM 2017 conference, held in Kyoto (Japan) from 27th August to 1st September 2017, is an international forum for discussing recent developments on advanced materials. This year 1D-NEON project's results are presented on Symposium C: Nano-materials science and technologies. 1D-NEON results on "Low power oxide electronics " presented at the Centre for Plastic Electronics Annual Symposium 2017 at Imperial College, London.